Ecosummit TV: CEO Pascal Mauberger pitches the French hydrogen storage startup at ECO12 Berlin. Founded in 2008, MyPhy Energy raised €15.2M in 2 rounds from Emertec, Sofinnova Partners and Gimv. They are now 35 people and want to grow to over 100 in a few years. McPhy’s technology is able to store large amounts of hydrogen at low pressure and enables onsite production and storage of hydrogen. If you take renewable energy as a source, you can create green hydrogen using an electrolyser from one of McPhy’s partners. McPhy Energy is on a promising growth path and if you need large-scale hydrogen storage, please get in touch with Pascal. Ecosummit TV: If your product isn’t totally green, i.e. its product carbon footprint is larger than zero, then your customers can still go green by neutralising it. Get Neutral has got a suitable green consumer marketing solution for this problem. According to the CEO Holger Rupp, the startup combines sustainability, marketing, mobile technologies and social networks. Ecosummit TV: Waste is a resource. Rolf Stein pitches Advanced Plasma Power (APP) at Ecosummit Berlin 2012. The UK-based startup has an efficient gas plasma technology to convert waste to energy. APP was founded in 2005 as a spin-off from the British engineering company Tetronics. The outcomes of APP’s Gasplasma process are syngas (synthetic gas), which is rich in Hydrogen, and Plasmarok, a solid material which can be used for multiple applications, e.g. as building material. Ecosummit TV: Marie-Anne Brodschii, VP Innovation at Veolia, explains how Veolia drives cleantech innovation and how the cooperation with startups works in practice. The French corporate has got cleantech in its DNA and is pretty big: 230.000 employees generate €29.6B revenues and are active on 5 continents. Veolia’s business is focused on the management of water, waste, energy and energy efficiency. In fact, Veolia is very open towards smart green innovation coming from startups. To foster open innovation, Veolia launched the Veolia Innovation Accelerator (VIA) 2 years ago. Ecosummit TV: The best entrepreneurs come from Estonia. Taavi Madiberk proves this claim during his disruptive pitch at Ecosummit Berlin 2012. The Estonian startup Skeleton Technologies develops and produces high energy batteries that benefit from high power density. As a result, Skeleton’s ultracapacitors are 50 to 80% cheaper than its competitors. Skeleton recently opened an office in Berlin and plans its first factory in Saxony. Skeleton’s value proposition and strategy sound very promising and it looks like investors are already chasing this smart green startup jewel. Moreover, it’s a lot of fun to watch übercool Taavi on Ecosummit TV. Ecosummit TV: Steven Fawkes, Partner at Matrix Group in the UK, is a real expert in energy efficiency and presents his insight into the most promising business models and investment opportunities. In fact, mankind is still extremely energy inefficient. We only use 11% of the primary energy for useful energy such as electricity or heat, the rest is wasted in the process of energy production, conversion and transmission. There are lots of areas where we can increase energy efficiency such as industrial processes, transportation, energy generation and buildings. Ecosummit TV: Stephan Rieke presents Etogas (ex-SolarFuel) which is the global first mover commercialising Power to Gas (P2G) technology. The German startup converts renewable energy to renewable methane (synthetic natural gas) by integrating electrolysis and methanation into one solution. Power to Gas is useful for storing and transporting huge amounts of energy and enables the coupling of the electricity and gas networks to create the smart green super grid. The motivation for developing the new P2G technology is driven by the volatility of wind and solar – the wind doesn’t always blow and the sun doesn’t always shine – and the resulting need for huge long-term energy storage. The potential storage capacity of Germany’s gas network could power the country for several months. Ecosummit TV: If we want to grow the Smart Green Economy, we need more capital and more people. Conrad Ess, CEO of Green Technology Staffing, talks about the art of recruiting new talent for the Smart Green Economy at ECO12 Berlin. Mannheim-based Green Technology Staffing has got 10 employees and currently over 300 cleantech engineering jobs to fill. Conrad’s key message is passion: we need to promote our companies and our jobs with more passion to attract new talent. Ecosummit TV: Hans Streng, SVP and General Manager of EV Charging Infrastructure at ABB, sold Epyon, which was incubated by Yes!Delft, to ABB and summarises his startup experience: “The true nature of a cleantech startup is how you manage continuous fluctuations and disruptions. Business changes on a day-to-day basis. The closer you get to the Internet domain, the faster the changes come. The closer you move to the CAPEX domain, the bigger the changes are.” At ECO12 Berlin, Hans presents ABB’s emobility strategy and talks about working with a small startup team inside a big corporate. Ecosummit TV: Fabienne Herlaut is the Managing Partner of the French corporate VC Ecomobilité Ventures that has 4 very powerful limited partners: SNCF, PSA Peugeot Citroen, Total and Orange. Fabienne presents her new €30M fund at Ecosummit Berlin 2012 and shares her investment strategy into smart green startups working on new technology and business models for sustainable mobility. I strongly recommend that you talk to Fabienne if you are an ambitious ecomobility startup with an international strategy that wants to take advantage of the added value of this promising group of corporates. Greenpocket from Cologne raised €3.5M in their Series B financing round led by NRW Bank, the development bank owned by the State of North Rhine-Westphalia. Greenpocket’s existing investors also participated and include Schwetje Digital (Betafabrik), Rheinland Venture Capital and KfW. The smart green startup was founded in 2009, has 40 employees and provides a powerful software platform for smart metering and smart home management. Greenpocket has 30 utilities as customers in Germany, Austria, Spain and UK. 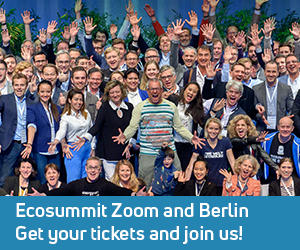 The CEO Thomas Goette pitched his startup at Ecosummit Berlin 2012 and you can watch Thomas on Ecosummit TV. We also did an interview with Thomas to learn more about the financing and Greenpocket’s international strategy.